All things green at The Green Living Show! 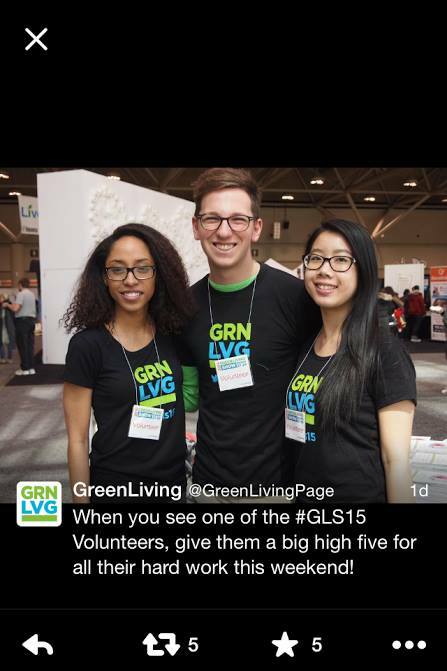 “The Green Living Show is Canada’s largest consumer show dedicated to all things green.” Last weekend, I volunteered for the Green Living Show at the Metro Toronto Convention Centre. It served as a great opportunity to support local businesses and check out tons of cool eco-friendly products and services. The show consisted of test driving eco-friendly cars, afternoon yoga classes, natural hair and beauty products, re-purposed jewelry, sustainable clothing, tasty local food, and a host of other wonderful products and ideas focused on sustainable living! Stay tuned: I will be doing reviews for some of my favourite products from the show! This is awesome! Can’t wait for the reviews to come out!